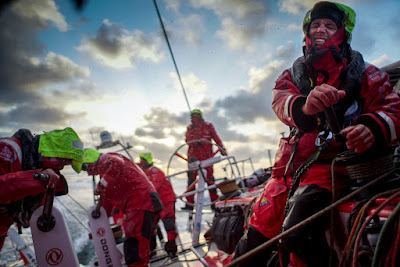 Dongfeng Race Team (Charles Caudrelier/FRA) and Team Brunel (Bouwe Bekking /NED) were fighting to keep their dreams of overall Volvo Ocean Race victory alive as Leg 8 shaped up for a thrilling finish at dawn in Lorient, France, on Thursday. The nine-month offshore marathon could hardly be more finely poised. So far, in the event that started in October last year in Alicante, some 37,000 nautical miles (nm) have been sailed in a full circumnavigation of the world. However, Abu Dhabi Ocean Racing (Ian Walker/GBR) need only to stretch their lead to eight points by finishing two places ahead of their Chinese and Dutch rivals, and the 12th edition’s title will be theirs. 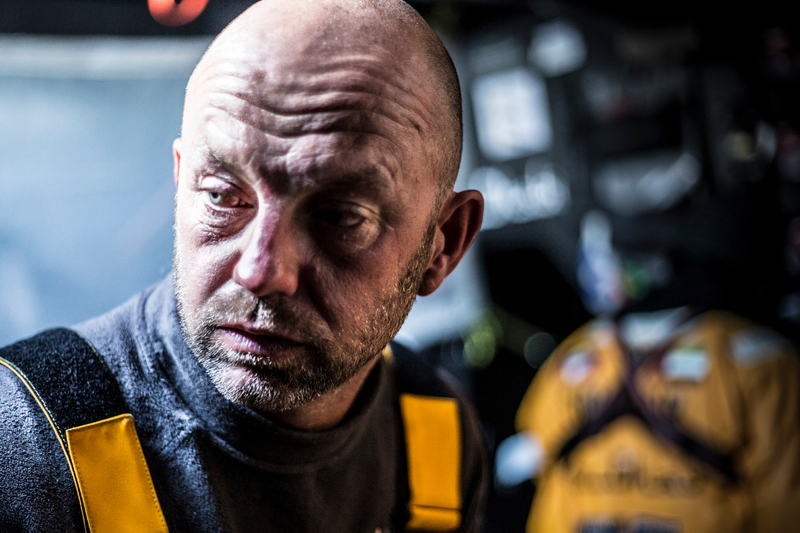 The Emirati boat’s skipper, Ian Walker, has barely captured a wink of sleep in the last 24 hours and by Wednesday’s 0945 UTC position report, he was well placed in third place, just ahead of Team Brunel and Dongfeng Race Team (see panel above). All is not lost for messrs Caudrelier and Bekking, however. 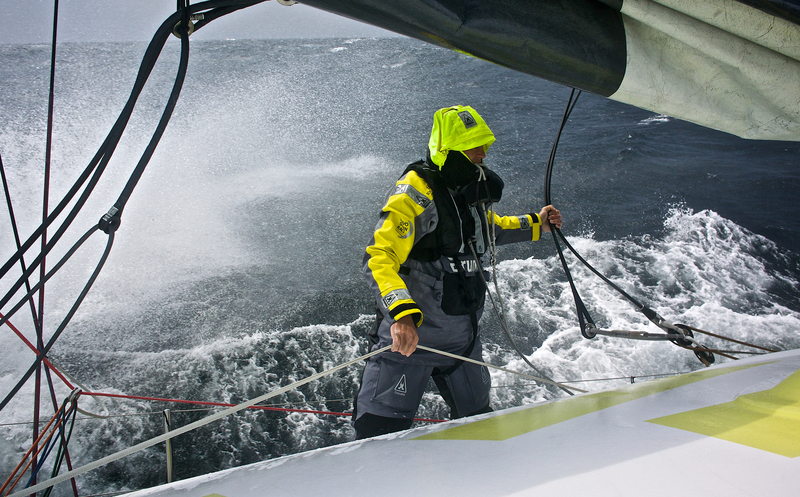 Conditions along the French coast continue to be challenging, with high winds and a choppy sea state. 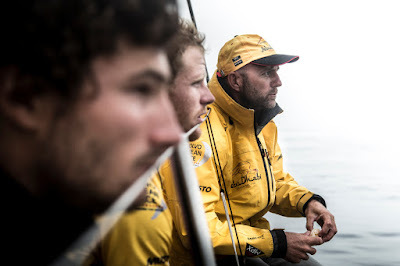 Key manoeuvres north towards the final destination of Lorient could yet decide the 647nm stage. 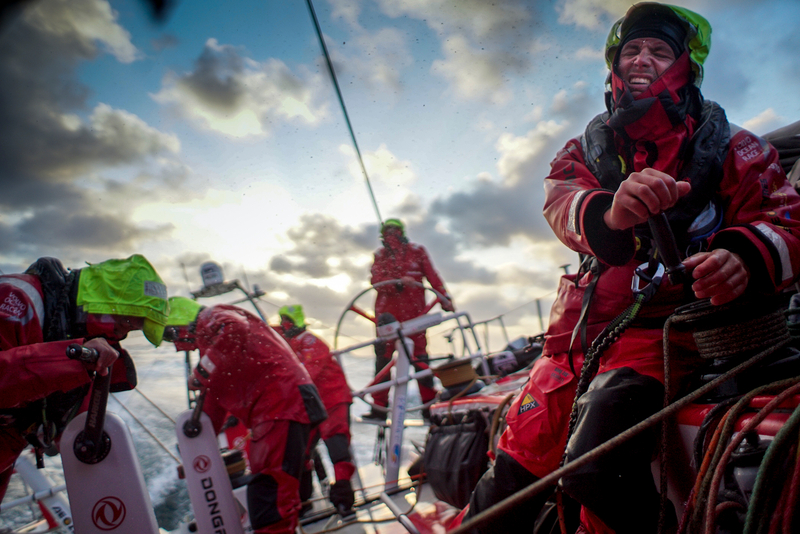 To add to Dongfeng Race Team and Team Brunel’s concerns, both had on-board breakages over the past 24 hours that threatened to hamper their progress. Bekking’s boat suffered damage on their J2 headsail. It blew out along the inside of a reinforcing strip. 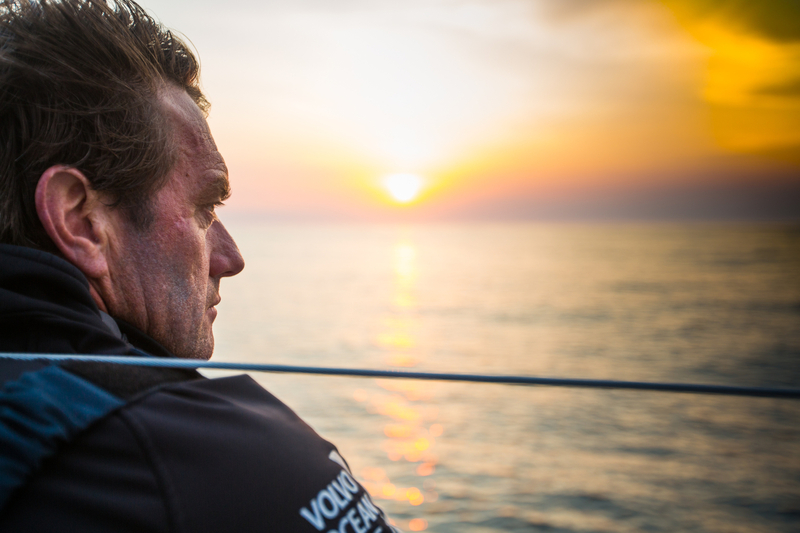 It is the key sail for the conditions the fleet is currently sailing in. 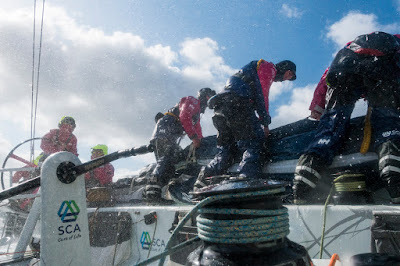 Meanwhile, Dongfeng’s electronic water-maker, converting sea water into drinking water, has broken and the crew are using a manual desalinator, which takes much longer to operate and wastes valuable man hours on board. At the head of the fleet, Team SCA (Sam Davies/GBR) and Team Vestas Wind (Chris Nicholson/AUS) are continuing to put the hammer down to close out what could be a remarkable leg victory for either of them. 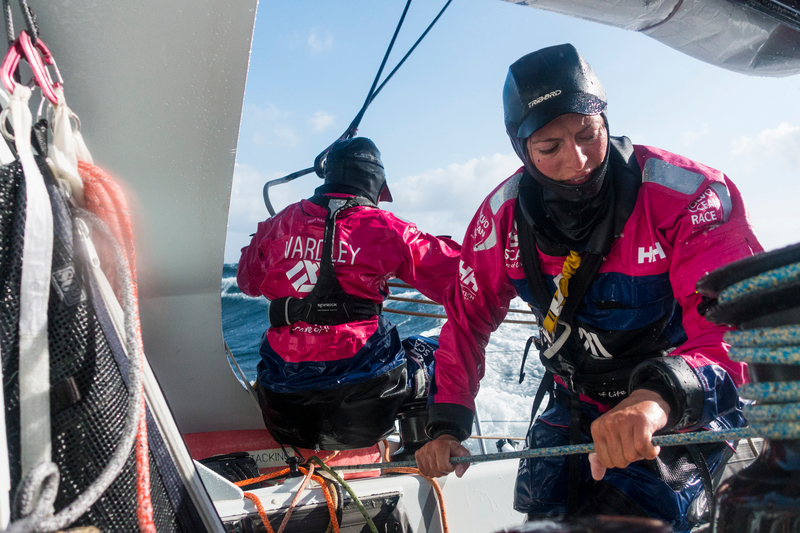 Team SCA are the first all-women’s challengers to enter offshore racing’s toughest challenge for 12 years and victory in Lorient, after a four-day ‘sprint’ from Lisbon, would mark the first female crew win in a leg since Tracy Edwards’ Maiden sailors achieved it on two occasions in the 1989-90 race. Navigator Libby Greenhalgh (GBR), brother of Rob Greenhalgh currently sailing on MAPFRE (Xabi Fernández/ESP), summed up in a blog sent late on Tuesday, the mounting excitement on board the blue and magenta boat. “How does it feel? Nerve-wracking, exciting, stressful, worried; butterflies are in my tummy,” she wrote. 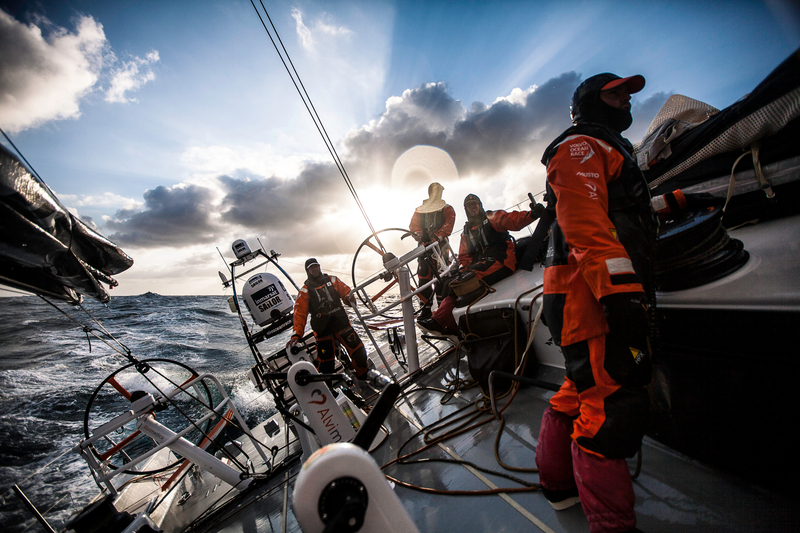 In the midst of all the excitement, spare a thought for Team Alvimedica (Charlie Enright/USA) and MAPFRE. Locked in the overall race standings on 27 points, 11 behind Abu Dhabi Ocean Racing, neither can realistically win the race barring disaster to the leaders. Yet their performance in the next 18 hours could hardly be more crucial in the context of the race. If they end up as the ‘sandwich’ between Walker’s Emirati boat and their Chinese and Dutch pursuers, then the event will be decided. The latest estimated time of arrival in Lorient, Brittany, is from 0400 UTC/0600 local time on Thursday with no quarter expected or given by any of the crews between now and then. This is round-the-world sailing on a knife-edge and few involved, on board or off it, have time or inclination for a wink of sleep until it’s all over. Just ask Ian Walker.